It’s been 8 days since WVU’s unfortunate loss to the Pitt Panthers. It was an untimely missed opportunity for the Mountaineers to play for their first national championship in the Sugar Bowl. 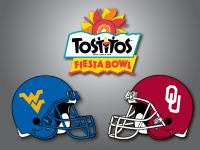 For WVU fans, the loss still stings but it’s time to look forward to team’s last game of this season: The Fiesta Bowl on January 2nd against the Oklahoma Sooners. The Sooners will be looking to avenge their loss in the same bowl to Fresno State which was one of the most memorable bowl games ever played. WVU will be playing for their second BCS bowl win in three seasons and some momentum to carry them into the 2008 season. A win vs. Oklahoma would also help quell the disappointment of falling short of their goal: a national championship. The feeling of falling short of your goal applies to a few of this year’s album releases (assuming that every reputable artist wants to distribute an entire record of solid material.) Of course, we live in an era of bits & bytes and hits & misses via the instant gratification syndrome. For the listener it takes a considerable smaller amount of effort to dive into a song as opposed to an entire record. And for the artist, the same viewpoint applies: it’s easier to pile all of your efforts into a single instead of the entire record. That’s not to say that the two albums below don’t contain some intriguing songs. They do, it’s just that the songs don’t add up to form intriguing albums. Two heavily downloaded artists from this year are Josh Ritter and The Arcade Fire. I’m a fan of both artists and I had the fortune to see Josh Ritter perform live two months ago. Both artists also released full-length albums (The Historical Conquests of Josh Ritter and Neon Bible) earlier this year that should have been EPs. In addition, both aforementioned album titles sound like long, almost overbearing works of art. For Josh Ritter, Historical Conquests was released 16 months after his most thorough album, The Animal Years. So, the album felt somewhat rushed partially because of the buzz from his previous album and the standout song, “Girl in the War.” Overall, Historical Conquestshas a different tone and purpose. It’s more of a noisy, enjoyable record that sounds as Josh puts it, “Like a group of musicians coming together and makin’ a racket.” Although Historical Conquests contains memorable songs such as “Empty Hearts” and “Right Moves,” the result is an uneven record that doesn’t live up to level of excellence demonstrated in The Animal Years. The Arcade Fire’s Neon Bible was one of the most anticipated albums of 2007. The leak of the spectacular, organ-drenched, “Intervention” from a BBC radio show helped fuel the anticipation. The thing that made The Arcade Fire’s album, Funeral so impressive was the feeling of urgency that ran through each track on the album. On Neon Bible, the feeling of of urgency is sporadic at best. More effort was put into the overall concept behind Neon Bible than the songs contained therein. Another problem is a snoozer of an opening track, “Black Mirror.” In addition, the track “Black Wave” kills the momentum that builds from the energy of “Keep the Car Runnin'” and “Intervention.” With all of this said, “No Cars Go” is one of my favorite tracks from any artist and any record from 2007. If you are looking for for a solid EP from 2007, look no further than the excellent EP from the Yeah Yeah Yeahs, Is Is. One of the longest running North American Live music television shows is Austin City Limits, which can be seen weekly on public television. ACL has featured the biggest names in musical talent over the years including Stevie Ray Vaughn, BB King, Tom Waits and Leonard Cohen not to mention cutting edge artists such as Cat Power, The Flaming Lips and the White Stripes. This season of ACL includes The Decemberists, Explosions in the Sky, Ladysmith Black Mambazo, Van Morrison and the most recent episode: an incideniary performance by The Arcade Fire. The Arcade Fire’s set on ACL was the most entertaining performances on the series since the Flaming Lips performed a few years ago. The band also got a warm welcome from an attentive and appreciative Austin audience. The highlights of the show were “Keep the Car Running,” “Rebellion (Lies,)” “Intervention” and “Neighborhood #1 (Tunnels)” which featured Regine Chassagne on the drums while Jeremy Gara shifted over to rhythm guitar. On occasion, Austin City Limits will release memorable shows on DVD. If the producers of ACL decide to so, this will be one to track down.